LAST UPDATE: 4/18/19 This page covers Walt Disney World special events and annual festivals in the theme parks, Disney resorts and Disney Springs. This is an UNOFFICIAL listing of Walt Disney World special events and activities, and while we make our best effort to keep it updated, complete and accurate, Disney changes things constantly. Be sure to call ahead before making any major plans based on the information below! For recurring Disney World special events (e.g., Epcot International Flower and Garden Festival, Mickey’s Very Merry Christmas Party) we update new information as it becomes available, but we do not remove the previous year’s information until the new year’s information becomes available. We do this so that you can get a general idea of what has been offered in the past, and the range of dates when it was offered. There are special meals available at certain restaurants on New Year’s Day. You can reserve holiday meals up to 180 days in advance by calling (407) WDW-DINE (939-3463). Note that “holiday pricing” (i.e. higher prices) will be in effect for some restaurants (particularly the buffets and character meals) from mid-December through the first few days of January (holiday season). Other restaurants may charge a premium on New Year’s Day, so be sure to ask when booking reservations. Each year in January or February the China Pavilion in Epcot has a Chinese New Year celebration. Usually there are Chinese acrobats and special activities for kids. In 2020, the Walt Disney World Marathon Weekend will be January 8-12. Registration will open April 16, 2019 at 10 am ET. The Walt Disney World Marathon Weekend is an entire running weekend at Walt Disney World Resort. Other highlights include a Half Marathon, Goofy’s Race-and-a-Half Challenge, a Family Fun Run 5K and Kids’ Races. Walt Disney World Annual & Season Passholders, Disneyland Annual Passport holders and DVC members are able to register ahead of the general public for some runDisney events. Check the Annual Passholder or DVC member website for details closer to the public registration date. For more information or to register, go to the Walt Disney World Marathon Weekend page. Don’t wait too long to register; the races reach full capacity very quickly! In 2019, the Epcot International Festival of the Arts was held January 18 – February 25. The Epcot International Festival of the Arts celebrates the visual, culinary and performing arts. There are art exhibits of Disney artists and musical performances throughout the Festival—from local bands to Broadway stars. Feast on artistic dishes with a Disney twist at themed food studios, eateries and dining events. You can also attend professional workshops and seminars to improve your own artistic skills. Annual Passholders and Disney Vacation Club members get 15% off select experiences. Along with the visual arts, Disney Theatrical brings a showcase of music and Broadway talent to the America Gardens Theatre stage. Disney on Broadway shows are included in theme park admission and takes place daily at 5:30, 6:45 and 8:00 pm. You can also book a Disney on Broadway Concert Series Dining Package that includes breakfast, lunch or dinner and a guaranteed priority seating at one of 3 concerts held the same day. For kids, there is Figment’s Brush with the Masters Scavenger Hunt; maps and stickers are available for purchase at various retail locations in Epcot. Kids search for artwork with Figment in the picture and add the location sticker to their map. Turn in the map to a Cast Member at a retail location to pick up a surprise. For more information, visit the Epcot International Festival of the Arts page. In 2019, the Disney on Broadway Concert Series Dining Package will be available for breakfast, lunch or dinner at participating Epcot restaurants, as part of the Disney on Broadway Concert Series at the Epcot International Festival of the Arts. Cost will vary depending on restaurant and mealtime selected. Dining packages include an appetizer, entrée, dessert and non-alcoholic beverage or one full buffet, where applicable, and guaranteed priority seating at one of 3 concerts held the same day. Dining reservations must be at least 2.5 hours prior to showtime. Magic Your Way Dine and Deluxe Dine packages will be accepted as payment (requires 2 table service entitlements per Disney on Broadway Concert Series Dining Package). Walt Disney World Annual & Seasonal Passholders get a a 10% discount on dining packages for the Disney on Broadway Concert Series throughout the festival, and a 20% discount on dining packages at Biergarten Restaurant and Coral Reef Restaurant for lunch and dinner through January 31, 2019. Discount applies to the regular price of food and non-alcoholic beverages. Valid for the Passholder and up to three guests. 2019 Disney on Broadway Concert Series Dining Package reservations opened on November 8, 2018. For more information or to make a reservation, go to the Disney on Broadway Concert Series Dining Package page or call (407) WDW-DINE (939-3463). Please note: admission to Epcot is required and is not included in the price. Advance reservations are highly recommended. Spring 2019 was the Atlanta Brave’s final season of spring training at Disney’s ESPN Wide World of Sports. Valentine’s Day is February 14 every year. Walt Disney World does not generally have any special events or activities for Valentine’s Day, but we have plenty of tips and ideas for adding some romance to a Walt Disney World trip. In 2020, the Disney’s Princess Half Marathon Weekend will be February 20-23. Registration will open June 4, 2019 at 10 am ET. This annual event includes Disney’s Princess Half Marathon, a Family Fun Run 5K, and Kids’ Races. For more information or to register, go to the Princess Half Marathon Weekend page. Don’t wait too long to register; the races reach full capacity very quickly! In 2020, Mardi Gras will be February 25. A little-known event on Mardi Gras is the mini-parade through Disney’s Port Orleans Resort. Several departments of the resort build floats on golf carts. The floats are judged and then parade through the grounds. During the parade they throw New Orleans-style trinkets (beads, candy, doubloons) to the guests who line up to watch. If you will be at Port Orleans Resort on Mardi Gras, be sure to ask at the front desk when this event will take place. In 2019, the Epcot International Flower and Garden Festival will be held March 6 – June 3. During the Epcot International Flower and Garden Festival, Disney punches up their landscaping at Epcot with additional topiaries, display gardens, wildlife habitats (including a butterfly garden) as well as offering some special tours. Outdoor Kitchens feature foods & beverages from the garden and grill. Garden Rocks concerts, featuring popular bands, rock the open-air America Gardens Theatre every night at 5:30, 6:45, and 8:00 pm and are included with admission to Epcot. Garden Rocks Dining Packages are available for breakfast, lunch or dinner on select days at a number of Epcot restaurants. For kids, there is Spike’s Pollen Nation Exploration a springtime scavenger hunt. In each garden, search for the plant Spike has pollinated, identifiable by Spike himself and a Spike’s Pollen Nation Exploration plant stake. Once you find him, add the corresponding sticker to your map. Maps and stickers are available for $7.44, tax included, at Port of Entry (at the entrance to World Showcase). After your search is complete, return your map to pick up a surprise. More information is on Disney’s Epcot International Flower & Garden Festival page. The festival, including all gardening programs and exhibits, is included in regular Epcot admission. The Garden Rocks Dining Package, available for breakfast, lunch or dinner on select days, is offered during the Garden Rocks Concert Series. Dining packages are available at 15 Epcot restaurants. Cost will vary depending on restaurant and mealtime selected. Dining packages include an appetizer, entrée and dessert—or one full buffet or family-style dining, where applicable—along with a non-alcoholic beverage and a guaranteed seat at one of 3 Garden Rocks concert performances later that day. Dining reservations must be at least 2.5 hours prior to showtime. 2019 Garden Rocks Dining Packages went on sale December 13, 2018. For more information or to make a reservation, go to the Garden Rocks Dining Package page or call 407-WDW-DINE (939-3463). Please note: admission to Epcot is required and is not included in the price. Advance reservations are highly recommended. In 2019, Easter Sunday will be April 21. In 2019, there will be a meet and greet with Mr. & Mrs. Easter Bunny in Bunny Lane Garden now through April 21 near the Town Square. In 2018, there was a special pre-parade down Main Street, U.S.A. on March 31, and April 1 (Easter Sunday). The parade featured Mr. & Mrs. Easter Bunny, Daisy, Duck, Thumper & Ms. Bunny, White Rabbit, Yellow Rabbit, Clara Cluck, Hippos, Ostriches, Dancing Chicks and the Azalea Trail Maids from Mobile, Alabama. For 2019, the Easter Egg-stravaganza scavenger hunt will be as April 5-21, maps and stickers are available for $7.44, tax included, at the following locations in Epcot: Pin Central (Future World), Disney Traders (at the entrance to World Showcase) and World Traveler (International Gateway). Return the map to Disney Traders in Epcot to pick up a surprise. Some of the Disney hotels offer egg hunts, egg decorating, characters in Easter costumes, etc. to their guests on Easter morning. If you are staying at a Disney hotel, inquire at the front desk when you arrive. Grand Floridian Resort pastry chefs usually display elaborate edible Easter Eggs in the lobby. In 2019, the Easter Eggs will be on display April 1- 27. There are special meals available at certain restaurants on Easter Sunday. An Easter Brunch is usually held each year at the Epcot World ShowPlace located between Canada and the United Kingdom pavilions. Regular Epcot admission is required. You can reserve holiday meals up to 180 days in advance on the Walt Disney World dining page or by calling (407) WDW-DINE (939-3463). Note that “holiday pricing” (i.e. higher prices) will be in effect for some restaurants (particularly the buffets and character meals) for the two weeks on either side of Easter. Other restaurants may charge a premium on Easter Sunday, so be sure to ask when booking reservations. In the past, services have been held on Easter Sunday only in the Fantasia Ballroom at the Contemporary Resort. Catholic Mass is at 8:00 am and 10:30 am. A Protestant service is held at 9:15 am. If you plan to attend, it is best confirm the time and location with the front desk or concierge. In 2020, the Star Wars Rival Run Weekend will be April 16-19. Registration will open July 16, 2019 at 10 am ET. This event includes a 5K, 10K, kids races and half marathon; runners can choose which side of the Force they will run for. New for 2019, runners can register for two special challenges. There is the Star Wars Rival Run Challenge, which involves running the 10K and the half marathon during the race weekend. There is also the runDisney Kessel Run Challenge, where runners complete the Star Wars Rival Run Half Marathon at Walt Disney World and run the Star Wars Virtual Half Marathon at home. For more information or to register, go to the Star Wars Rival Run Weekend page. Don’t wait too long to register; the races reach full capacity very quickly! In 2019, Party for the Planet will be April 20-22. Animal Kingdom celebrates the magic of nature and Disney’s commitment to conservation with a Party for the Planet! There are family-friendly experiences and special interactions with the animal care experts and education instructors throughout the park. There are also unique character appearances and special entertainment. In 2019, Tiffins Talks with Disney Imagineer Joe Rohde, will be offered April 20-22 from 1:00 pm – 3:00 pm at Tiffins Restaurant. During a 4-course lunch featuring global dishes, desserts and specialty beverages, Joe Rohde will discuss his travels and adventures from the the Kazakh Eagle Festival in Mongolia to the temple ceremonies of Bali and more. Tickets cost $211.94 per person, tax included. Regular admission to Animal Kingdom is required. For more information, go to the Party for the Planet webpage. Cinco de Mayo (5th of May) is a celebration of Mexican heritage and commemorates a Mexican victory in the 1862 Battle of Puebla. There is a relatively low-key Cinco de Mayo celebration centered on the Mexico Pavilion at Epcot, tied in with the International Flower & Garden Festival. It usually features some sort of special activity for families. In 2019, Mother’s Day will be May 12. On Mother’s Day, the second Sunday in May, some Walt Disney World Resort restaurants offer a special brunch menu. For more information about Mother’s Day meals or to make a reservation, go to the Walt Disney World dining page or call (407) WDW-DINE (939-3463). In 2018, Star Wars: Galactic Nights was held on May 27 from 7:00 pm until midnight at Disney’s Hollywood Studios. Star Wars: Galactic Nights is a one-night special event that celebrates all things Star Wars, with special entertainment, character encounters and photo opportunities. During this event, the facade of the Hollywood Tower Hotel transforms via projection technology to showcase familiar locations from across the galaxy. Both Star Wars: A Galactic Spectacular fireworks and the Star Wars: A Galaxy Far, Far Away stage show will be enhanced with new saga elements. Select attractions will be open to all guests – and some may even offer a special Star Wars twist just for this event. In 2018, Star Wars: Galactic Nights included activities to celebrate the release of Solo: A Star Wars Story. Actor Joonas Suotamo who plays Chewbacca in Solo: A Star Wars Story, made a special appearance. The event’s Star Wars: A Galaxy Far, Far Away presentation debuted some footage from Solo: A Star Wars Story. And the nighttime projection show, Star Wars: A Galactic Spectacular, debuted a new action sequence from the film. A special Galactic Tasting & Viewing Package included admission to a panel discussion about the making of Star War: Galaxy’s Edge. Attendees can wear costumes (subject to a few rules based on safety and appropriateness), but guests ages 14 and older are strongly discouraged from wearing layered costumes or costume props that surround the entire body. They may be subject to additional security screening. Tickets cost $137.39 per adult and $132.06 per child (ages 9 and under), tax included. There are a limited number of tickets for this event. 2018 tickets for Star Wars: Galactic Nights went on sale February 16, 2018. For more information or to purchase tickets, go to the Star Wars: Galactic Nights page. This package was offered at the Star Wars: Galactic Nights event on May 27, 2018. Enhance your Star Wars: Galactic Nights experience with the Galactic Tasting & Viewing Package. Tasting-sized sips and bites inspired by the stories and characters of Star Wars were available at various locations throughout the park. With the Galactic Tasting & Viewing Package, you could choose 5 items. Then, at the designated time, join a panel of team members from Walt Disney Imagineering and Lucasfilm as they take you inside the making of Star Wars: Galaxy’s Edge, the Star Wars-themed land, coming to Disney’s Hollywood Studios and Disneyland in 2019. The Galactic Tasting & Viewing Package is $30 per person, tax included. To make a reservation for the 2018 Galactic Tasting and Viewing Package, go to the Galactic Tasting & Viewing Package page or call (407) WDW-DINE (939-3463). You can also purchase this experience in-person during the Star Wars: Galactic Nights event. Please note: admission to Star Wars: Galactic Nights is required and is not included in the price. In 2019, Disney H20 Glow Nights will be held at Typhoon Lagoon on Thursdays and Saturdays (except Thursday June 20) from May 30 – August 24, from 8 pm – 11 pm. Guests may arrive as early as 6:00 pm. On select summer nights, special lighting effects transform Typhoon Lagoon Water Park while Buzz, Woody and Jessie throw a Beach Party inspired by their friend, “Partysaurus” Rex. Activities include dancing on the beach, party games, and meet ups with Buzz, Woody and Jessie, plus, all attractions will be open. The cost is $62.84 per adult (age 10+) and $57.51 per for child (age 3-9), tax included. Please note: Disney H20 Glow Nights are a separate ticketed event and the party is not included in daytime admission. 2019 tickets for Disney H20 Glow Night went on sale January 15, 2019. For more information or to purchase a ticket, go to the Disney H2O Glow Nights page or call (407) 939-1872. Please note: this ticket does not include daytime admission to Typhoon Lagoon. Magic Kingdom offers a special Independence Day fireworks show on July 3 & 4 in the Magic Kingdom above Cinderella Castle. There are also dance parties in Tomorrowland and Frontierland during the fireworks show. These activities are included in regular park admission. At Epcot, on July 4 there is a special Independence Day version of Illuminations: Reflections of the Earth. Disney characters are dressed in patriotic attire throughout the day at the American Adventure Pavilion. Voices of Liberty, the eight-part a cappella group, has a special performances at the American Gardens Theatre at 5:30, 6:45 and 8:00 pm. These activities are included in regular park admission. Disney’s Animal Kingdom does not offer fireworks since they would disturb the animals. If you plan to visit one of the theme parks on July 4 (particularly if it falls on a weekend), be aware that it is one of the most popular days of the year. The parks may reach full capacity at some point during the day, and you may not be admitted (or re-admitted) to the parks until the crowds die down again, usually around dinner time. (This can happen even if you have a ticket, even if you’re staying at a Disney resort and even if you have dining reservations in the park. If the park is full, it’s full — Disney has to follow fire codes!) For that reason it’s best to arrive first thing in the morning and stay in the same park all day, or if you plan to leave, don’t plan anything (like dinner reservations) that would require you to re-enter in the afternoon. Bring any items you may need later and stow them in a locker when you arrive (the lockers will also sell out). Get FastPasses right away if you think you will want to ride anything, because the lines will be very long by noon. For 4th of July in 2019, Disney will offer Woody’s Roundup Barbecue Buffet at Disney’s Contemporary Resort on July 4-6 from 6:15 pm – 9:15 pm in the Fantasia Ballroom at Disney’s Contemporary Resort. Celebrate the 4th of July with the characters from Toy Story! In addition to a barbecue buffet, there will be character meet and greets, camp-style carnival games, a Make-Your-Own Toy Station, a Buzz Lightyear playtime zone and more. At the end of the night, guests can head to the Porte Cochére to view the Magic Kingdom nighttime spectacular. Tickets are $149 per adult (age 10+) and $99 per child (age 3-9), tax and gratuity included. Space is limited. Reservations can be made online or by calling (407) 939-3463. On July 14 the France Pavilion in Epcot celebrates Bastille Day, which commemorates the beginning of the French Revolution. This is a low-key event, but there are special activities for kids and adults. In 2019, Gay Days will be held August 13-19. While this is not a Disney-sponsored event, it is a very well-attended one. Gay Days originally began in 1991. At the time it was “Gay Day in the Magic Kingdom,” a single day when the gay and gay supportive community was encouraged to “Wear Red and Be Seen” while visiting the world’s most popular theme park. Over the years it has grown to a week-long event. Visit GayDays.com for more info. The 2019 Epcot International Food and Wine Festival will be held August 29 – November 23. Each fall, Epcot hosts the International Food and Wine Festival, a several-weeks-long celebration that includes both “free” (i.e. included in Epcot admission) and separately ticketed events such as Party for the Senses, food and wine pairings, specialty dinners, culinary demonstrations and wine/beverage and cheese seminars. Epcot guests can enjoy the flavors of more than 25 international marketplaces dotting the World Showcase promenade. Tapas-sized portions of regional specialties run $3 to $8 each; recommended wines and/or beers pairings are available at each kiosk as well. New for 2018, the Epcot Food & Wine Tailgate Tasting, hosted by ESPN’s Monday Night Football, is a FREE program offered on September 17, 24 and October 1, 8 and 15 from 4:30-5:15 pm in the Festival Center. This 45-minute program includes a flight of three sample size food items inspired by the cities playing in the game each week along with three different beverages, while culinary experts explain how to prepare these dishes. To attend, pick up a wristband at the Festival Center starting at 9 am for that day’s seminar. All guests must be present to receive their wristbands. Both wristbands and seating at the event are available on a first come, first serve basis. New for 2018, on select Sundays throughout the Festival, start your day with a 2-hour brunch and cooking demonstration from a celebrity chef at Sunday Brunch with the Chef. Attendees will be part of an in-depth question-and-answer session featuring kitchen tips, tricks and insights. The event ends with an exclusive meet-and-greet photo opportunity with the chef. This is a separately ticketed event. The Festival Welcome Center, with a wine bar, tasting seminars and free sessions with cookbook authors and hands-on workshops. Some 270 chefs, including Disney chefs and guest chefs from across the country conducting culinary demonstrations and hosting dinners and tasting events. The Party for the Senses grand tasting event with tempting bites from eminent chefs, more than 50 wines and beers and live entertainment. Eat to the Beat concerts performed three times each evening August 29 – November 19, 2019 at America Gardens Theatre. Disney Wine & Dine Half Marathon – work off some of those extra calories! For kids, there is Remy’s Ratatouille Hide & Squeak, a search throughout the World Showcase for Remy statuettes and the ingredients he needs to make his signature ratatouille. Maps and stickers are available for $9.95 plus tax at the following locations in Epcot: Disney Traders, Festival Center, Pin Central and World Traveler (International Gateway). Return your map to the redemption location by the last day of the Food & Wine Festival to pick up a surprise. New for 2018, Junior Chef Kitchen gives kids a chance to become a chef and eat what they make in a FREE family-friendly experience every Sunday at the Festival Center. For more information, go to the Epcot International Food & Wine Festival page. Wondering what it’s really like? You can read MouseSavers’ review of the 2010 Food & Wine Festival “international marketplaces” (aka food booths). Go on a weekday (Monday through Thursday) for the lowest crowds. Friday nights, all day/evening Saturday and all day Sunday are the busiest times, because locals come when they are off work. Arrive right at opening (11:00 am) and eat your way “around the world” at the marketplace booths for lunch. It’s cooler, the crowds are much lighter than in the evenings, and there are fewer drunk people. If you are on a dining plan, you can use your snack credits for the food items (but not alcoholic beverages) at the Food & Wine marketplace booths. This is a great deal because normally snack credits are good only for individual snack items priced under $4, but some of the booth items cost $8 or more. Qualifying items are marked on the marketplace booth menus with a Dining Plan logo. The Disney Food Blog Guide to the Epcot International Food & Wine Festival e-Book can help you get the most out of this fantastic annual event. It offers 160 pages of tips, information, and advice to help you enjoy every minute of your time, including a full schedule of daily events, menus and photos from every World Showcase booth and customized touring strategies. Certain Epcot International Food & Wine Festival events, demonstrations and seminars (such as the Sunday Brunch with the Chef, Party for the Senses, Eat to the Beat dining packages, cheese and beverage seminars) require reservations and payment of an additional fee over and above park admission. Check the Epcot International Food & Wine Festival page for a complete list of these events. Please note: these events are very popular and it is advisable to book as early as possible. Tickets are non-refundable and non-transferable. 2018 Food and Wine Festival Events tickets for dining packages, special event and seminars went on sale June 14. You can make a reservation through the Epcot Food & Wine Festival page or by calling (407) WDW-FEST (939-3378). Disney Vacation Club Members can book these events through the Epcot Food & Wine Festival page or by calling Member Services at (800) 800-9800. Please note: In 2019, the Eat to the Beat Concert series will run from August 29 – November 19, ending a few days earlier than the Food & Wine Festival in order to prepare for the Candlelight Processional. Enjoy musical evenings during the Food & Wine Festival with the “Eat to the Beat” concerts scheduled August 29 – November 19, 2019 at 5:30, 6:45 and 8:00 pm on the America Gardens Theatre stage. Please note: lineup is subject to change. You can make FastPass+ reservations for the Eat to the Beat concert series. Normal FastPass+ booking guidelines apply. You can also book an Eat to the Beat Dining Package that includes breakfast, lunch or dinner and a guaranteed seat at the Eat to the Beat concert held on the same day. The Eat to the Beat Dining Package, available for breakfast, lunch or dinner, is offered during the Eat to the Beat Concert Series. Dining packages are available at 15 Epcot restaurants. Cost will vary depending on restaurant and mealtime selected. Dining packages include an appetizer, entrée and dessert—or one full buffet or family-style dining, where applicable—along with a non-alcoholic beverage and a guaranteed seat to the Eat to the Beat Concert held on the same day. Dining reservations must be at least 2.5 hours prior to showtime. 2018 Eat to the Beat Dining Packages went on sale June 14. Go to the Eat to the Beat Dining Package page or call (407) WDW-FEST (939-3378). Please note: admission to Epcot is required and is not included in the price. Advance reservations are highly recommended. Halloween decorations start going up in the Magic Kingdom in late August (generally before Labor Day weekend) and are complete in time for the first Mickey’s Not So Scary Halloween Party. If you are staying at one of Disney’s resorts over Halloween, ask the front desk concierge whether any special events are planned. Frequently the resorts do offer some kind of festivities. Disney Springs offers live entertainment such as music, storytelling, a dance party, stilt walkers and/or magicians on Halloween. Trick-or-treating was eliminated as of 2011. In 2019, Mickey’s Not So Scary Halloween Party will be offered from 7:00 pm to midnight on August 16*, 20*, 23*, 27*, 30*; September 2*, 6*, 8*, 10*, 13*, 15*, 17*, 20*, 22*, 24*, 27*, 29*; October 1*, 3*, 4*, 6*, 8*, 10*, 11*, 14*, 15*, 17*, 18*, 20*, 21*, 24*, 25*, 27*, 29, 31 and November 1*. Mickey’s Not So Scary Halloween Party is held on select nights in August, September and October each year from 7:00 pm to midnight, after the regular closing of Magic Kingdom, and requires separate admission. (You don’t have to have paid admission on the same day to the Magic Kingdom in order to attend the special after-hours event.) Guests with Not So Scary Halloween Party tickets are admitted to the park as early as 4:00 pm. You will need to get a wristband that allows you to stay in the park after the party begins. Admission to Mickey’s Not So Scary Halloween Party includes trick-or-treating for adults and kids, costume parades for little ones, character meet-and-greets, fortune tellers, Halloween riverboat ride, two performances of Mickey’s Boo-to-You Halloween parade and the Happy HalloWishes Fireworks Spectacular. Plus, most of the major attractions are open. You can purchase tickets to the Happy HalloWishes Dessert Party which includes a view of the Happy HalloWishes Fireworks Spectacular and admission to a reserved viewing area for Mickey’s Boo-To-You Halloween Parade. Attendees can wear costumes (subject to a few rules based on safety and appropriateness), but guests ages 14 and older are strongly discouraged from wearing layered costumes or costume props that surround the entire body. They may be subject to additional security screening. Check Walt Disney World’s costuming guidelines for more details. In 2018, Hocus Pocus Villain Spelltacular, performed on the Castle Forecourt Stage, features the mischievous Sanderson Sisters from Disney’s Hocus Pocus. With the help of the Disney villains, Winifred, Mary and Sarah gather together sinister shadows, nefarious nightmares and the power of their frightful friends to conjure the ultimate Hocus Pocus Party Potion and cast a spell on everyone in the Magic Kingdom Park. In 2018, several attractions were transformed just for Mickey’s Not So Scary Halloween Party. The Mad Tea Party had new lighting and effects to give it a new feel and possibly transform your costume. On Pirates of the Caribbean, pirates invade and interact with sailing guests, who can join the search for “Gunpowder Pete.” Space Mountain had a new soundtrack and special effects. Is Mickey’s Not So Scary Halloween Party worth the money? Depends on how much you are “into” Halloween. Some of the experiences available during the party are not offered at any other time, so it allows you to enjoy Magic Kingdom in a unique way. It’s fun to have dinner at one of the in-park restaurants like Skipper Canteen, Tony’s Town Square, Liberty Tree Tavern or Be Our Guest just before the party. This allows you to be in the park right when the festivities begin. The in-park restaurants book up quickly, so make reservations as early as possible (180 days in advance). Adult ticket prices start at $84.14, tax included, when purchased in advance and $94.78, tax included, at the gate (if available). In the past, Friday nights in October and the final week leading up to Halloween have sold out in advance. *Disney Vacation Club members and Disney Annual and Seasonal Passholders can buy advance discounted tickets for all August and September dates and selected dates in October. Tickets must be purchased in advance. In the past, Active Duty, Retired, and Permanently Disabled US Military (with current military ID) have been able to purchase discounted tickets for themselves and up to 5 family/friends for select dates. The tickets may be purchased at any theme park ticket window or Guest Relations Office. They may also be available at Shades of Green or MWR/ITT locations, which do not charge tax. Tax is added if purchased at the theme parks. 2019 Mickey’s Not So Scary Halloween Party tickets went on sale January 15, 2019. Tickets can be purchased through Undercover Tourist (there’s no discount, but it can be convenient if you’re buying other tickets at the same time), or direct from Disney via the Mickey’s Not So Scary Halloween Party page. In 2018, the Happy HalloWishes Dessert Party was offered August 17, 24, 28, 31; September 3, 7, 9, 11, 14, 16, 18, 21, 23, 25, 28, 30; October 2, 4, 5, 8, 9, 11, 12, 14, 16, 18, 19, 21, 23, 25, 26, 28, 30 and 31 as part of Mickey’s Not So Scary Halloween Party. This separately ticketed premium event includes a private dessert party with a view of the Happy HalloWishes Fireworks Spectacular and admission to a reserved viewing area for Mickey’s “Boo-To-You” Halloween Parade. The Happy HalloWishes Dessert Party costs $89.46 per adult and $53.25 per child (ages 3 to 9), including tax. Admission to Mickey’s Not So Scary Halloween Party is required and is not included in the price. Seating will be available at the dessert party, where it will be pre-assigned. Please note that Mickey’s Not So Scary Halloween Party is a separate ticketed event and is not included in Magic Kingdom Park admission. Reservations are highly recommended. Reservations for the 2018 Happy HalloWishes Dessert Party opened on May 24. Go to the Happy HalloWishes Dessert Party page or call (407) WDW-DINE (939-3463) to book. Please note: admission to Mickey’s Not So Scary Halloween Party is required and is not included in the price. Club Villain was not held in 2017 or 2018. In 2016, Club Villain was held on September 2, 3, 9, 10, 16, 17, 23, 24, 30; October 1, 7, 8, 14, 15, 21, 22, 28, 29 and 31; every Friday and Saturday night in November 2016 and December 2016 and every Friday night in January 2017. Club Villain is a special ticketed event held in Sunset Showcase in Disney’s Hollywood Studios. The mysterious Dr. Facilier is your host for the evening, welcoming guests and his friends from the “other side” to his parlor of mystical mishaps, with musical numbers and a wicked mix from his house DJ. Also stopping by to socialize are those divas of evil, Maleficent, Queen of Hearts, Cruella De Vil and the Evil Queen. Enjoy fiendish concoctions from the Potions Bar, savor culinary delights from New Orleans and beyond, meet with the villains and dance the night away. Showtimes were at 5:15 pm and 8:30 pm. Tickets were $129 per person, tax and gratuity included. A separate ticket for admission to Disney’s Hollywood Studios is required. 2016 tickets for Club Villain went on sale July 14. Go to the Club Villain page or call (407) WDW-DINE (939-3463) to book. Please note: admission to Disney’s Hollywood Studios is required and is not included in the price. In 2018, Return to Sleepy Hollow took place on September 28-30, October 3-7, 10-14, 17-21 and 24-31 at 8:00 pm and 10:00 pm. Enjoy a group viewing of the 1949 Disney animated classic film The Legend of Sleepy Hollow inside the Fort Wilderness Resort & Campground’s Tri-Circle-D Ranch stables and an up close and personal encounter with the Headless Horseman. All attendees, age 3 and older, will receive an exclusive limited edition pin. General seating costs $22 per person, including tax. Premium seating costs $38 per person, including tax, and includes a priority photo opportunity with the Headless Horseman and a Halloween treat bag. Guests age 2 and under are admitted for FREE, but are asked to sit in a parent’s lap. New for 2018, there was a dessert party at 9 pm, the cost is $60 per person, including tax. Attendees of either show can go to the dessert party. 2018 Return to Sleepy Hollow reservations opened on March 23. Call (407) WDW-TOUR (939-8687) to book. Space is extremely limited. In 2019, the Disney Wine & Dine Half Marathon Weekend will be held October 31 – November 3. Registration opened March 19, 2019 at 10 am ET. Runners who complete the Disney Wine & Dine 10K on Saturday and the Disney Wine & Dine Half Marathon on Sunday within the pacing requirements will receive Lumiere’s Two Course Challenge Medal. Registration for Lumiere’s Two Course Challenge is required to receive the Lumiere’s Two Course Challenge Medal. For 2019, Epcot International Festival of the the Holidays will take place November 29 – December 30. For Epcot International Festival of the Holidays, each pavilion’s holiday celebration comes to life for through the sharing of joyful music and time-honored traditions. Each night, the Epcot evening spectacular of lights, lasers and fireworks, Illuminations: Reflections of Earth, completes the celebration with a magical holiday finale. (Please note: 2018 was the final holiday season for IllumiNations. IllumiNations: Reflections of Earth will run to the end of summer 2019 and be replaced with a new nighttime fireworks spectacular.) Epcot International Festival of the Holidays is included with regular Epcot admission. There will be live musical performance and multiple Holiday Kitchens, serving up holiday cookies and other sweet seasonal treats from around the world. Use the Festival Passport to track your purchases of five select holiday cookies, then, stop by Holiday Sweets and Treats to receive a special complimentary “completer” cookie and a glass of milk! Meet Santa and Mrs. Claus and pose for a photo at The American Adventure. Kids can be on the lookout for Chip and Dale in each World Showcase pavilion. Once you spot them, add the corresponding ornament sticker to your map. The Chip & Dale’s Christmas Tree Spree map and stickers can be purchased for $7.44, tax included, at select merchandise locations (while supplies last). Return the completed map to the designated location and exchange it for a festive surprise. For more information, go to the Epcot International Festival of the Holidays page. The 2019 Advocare Invitational (formerly known as the Orlando Classic) will be held November 28, 29 & December 1 at the HP Field House at ESPN Wide World of Sports Complex. Each year ESPN cooks up a Thanksgiving weekend basketball feast so big that even if a match-up or two turns out to be a proverbial “turkey,” the event still will provide roundball junkies with a memorable holiday treat. For more information or to purchase tickets, visit ESPN’s Advocare Invitational page. In 2019, Thanksgiving will be November 28. Thanksgiving is always the fourth Thursday in November. There are special meals available at many Disney World restaurants on Thanksgiving. Reservations for holiday meals can be booked up to 180 days in advance by calling (407) WDW-DINE (939-3463). Note that “holiday pricing” (i.e. higher prices) will be in effect for some restaurants (particularly the buffets and character meals) from the weekend prior to Thanksgiving through the weekend after Thanksgiving. Other restaurants may charge a premium on Thanksgiving Day, so be sure to ask when booking reservations. Christmas decorations at the Walt Disney World Resort usually begin going up around the first of November. The decorations are gradually added at night and are substantially complete at Magic Kingdom by the time of the first Mickey’s Very Merry Christmas Party (in 2018, that was November 8), with the resorts and other parks completed by the day after Thanksgiving. The decorations usually start coming down about January 3. Each year during the holiday season, Jungle Cruise transforms into the Jingle Cruise. As you make your way through attraction queue, check out all the merry décor that’s been mailed to the skippers, or that they’ve created themselves. They even add a few holiday jokes to their tours to help everyone get in the spirit. The Disney resorts are all decorated for the holidays, as are the theme parks. Each theme park will have an enormous decorated Christmas tree and so will the Deluxe resort lobbies. Among the especially amazing decorations are the edible holiday displays whipped up by pastry chefs throughout Walt Disney World Resort. Gingerbread goodies are sold nearby. Most of the displays open on Thanksgiving weekend. The Deluxe resorts at Walt Disney World offer fantastic edible displays. Beach Club Resort usually has a fully detailed, life-sized gingerbread carousel in the lobby. The lobby of Yacht Club Resort has had displays such as a miniature New England-style train racing through a sugary rock mountain surrounded by a candy-coated model village. The Contemporary Resort and BoardWalk Resort always have a gingerbread display. The biggest edible production is a gingerbread house at Grand Floridian Resort that is large enough that it doubles as a real bake shop. Featuring gingerbread using a classic Austrian recipe, the bake shop offers freshly baked items such as cookies, ornaments and miniature gingerbread houses. Other homemade items for sale may include Stollen Bread, chocolate peppermint bark, lollipops and special Grand Floridian logo boxes filled with truffles. Demonstrations of how to decorate a gingerbread house take place in front of the bake shop. The gingerbread house usually opens in mid-November. The Gingerbread Bake Shop in Epcot is a life-sized gingerbread house is made entirely of gingerbread, cookies and icing. It features a bake shop that usually opens in late November as part of Epcot International Festival of the Holidays. The Disney Food Blog Guide to the Walt Disney World Holidays e-Book has great coverage of the edible holiday displays, restaurants offering special meals or menu items, information on new or special time-limited shows, and lots more. For 2018, the Dream Lights were turned on each evening beginning November 8. In the past the Dream Lights have run through mid-January. Disney decorates Cinderella Castle for the holiday season with a “Dream Lights” effect that makes the Castle seem to be covered in ice. Over 200,000 lights are draped over the turrets and roofs of the Castle to create this beautiful effect. A short show called A Frozen Holiday Wish and a castle lighting ceremony (featuring Queen Elsa from Frozen) is held each evening, usually around 6:15 pm, and the lights remain on, slowly changing colors, for the rest of the evening. For 2018, Flurry of Fun at Disney’s Hollywood Studios was held November 8, 2018 – January 6, 2019. During this time Hollywood Studios will have special seasonal decorations, shows and more. Santa Claus will be at the Once Upon a Time shop November 9 – December 24. Santa Goofy will be there from December 25 – 31 when Old Saint Nick returns to the North Pole. Each night during Sunset Seasons Greetings, billboards on Sunset Boulevard comes to life and tell a tale, courtesy of iconic characters sharing their love for the season. All the while, the Hollywood Tower Hotel—a.k.a. The Twilight Zone Tower of Terror—magically transforms, bringing to life the characters’ stories. This experience runs continuously throughout the night. The holiday spectacular Jingle Bell, Jingle BAM! takes place nightly above and around the Chinese Theater. Reserved viewing is available for select nights if you purchase tickets to the Jingle Bell, Jingle BAM! Holiday Dessert Party. Toy Story Land will be decorated for the holidays with oversized cranberry-and-popcorn garland, a 10-foot-tall Hamm sugar cookie and more. Guests can hear sleigh bells ringing on Slinky Dog Dash, while Alien Swirling Saucers will offer two holiday tunes with themed lighting. Characters will dress up as well; Woody and Jessie will sport special holiday vests and sprigs of holly on their hats, while Buzz Lightyear will wear a snazzy Santa hat. Just for the holidays, Olaf will join the cast of For the First Time in Forever: A Frozen Sing-Along Celebration at the Hyperion Theater. The show will include a seasonal finale featuring Olaf and three songs from Olaf’s Frozen Adventure. New for 2018, Echo Lake gets a merry makeover with extra-large ornaments, colorful garlands and a giant Christmas tree centered on the water. Even Dinosaur Gertie will be festively dressed for the occasion. For more information, go to the Flurry of Fun at Disney’s Hollywood Studios page. For 2018, Holidays at Disney Springs was held November 8, 2018 through January 5, 2019. Holidays at Disney Springs includes a variety of holiday entertainment, specialty foods and festive décor. Enjoy Toy Soldier stilt walkers, Snowflake performers, pop carolers and a cappella groups. There are special performances celebrating Kwanzaa, songs and stories in honor of Hanukkah as well as a holiday-themed DJ dance party and a nightly tree lighting ceremony. Meet Santa at the Christmas Tree Trail cottage, across from Once Upon a Toy. Check in a the podium and give them your mobile phone number to secure your place in a virtual queue line. You can take pictures with your own camera or use PhotoPass. Santa will be greeting guests daily through December 24. For kids, there is Stitch’s Holiday Gift Hunt – use the clues to find Stitch’s gifts for his family. Pick up a Holiday Gift Hunt booklet containing a map, clues and stickers at any participating location. Visit each gift hunt site, spot the hidden Stitch holding up one of his presents and then match the correct gift sticker to its corresponding location on the map. Then go to a redemption center to collect a festive surprise. Stroll through the Christmas Tree Trail, a collection of custom-decorated trees. Each one has been designed to capture a popular Disney theme. Begin your walk near the play fountain outside Once Upon a Toy in the Marketplace. There are over-sized toy sculptures throughout Disney Springs, the perfect place to pose for family photos. In 2018, Jingle Bell, Jingle BAM! was performed November 6, 2018 – January 6, 2019. Jingle Bell, Jingle BAM! is a nighttime holiday spectacular in Disney’s Hollywood Studios that takes place above and around the Chinese Theater. Santa Claus is missing and the search-and-rescue mission to get The Big Guy back to the North Pole in time for Christmas Eve is all part of the fun. Enjoy memorable holiday moments from Disney films including Mickey’s Christmas Carol, Beauty and the Beast, Pluto’s Christmas Tree, Bambi, Tim Burton’s The Nightmare Before Christmas and more. This show combines state-of-the-art projections, fireworks, special effects and Christmas music to create a dazzling, one-of-a-kind holiday experience for guests – capped by a special message from Santa himself. Reserved viewing is available for select nights if you purchase tickets to the Jingle Bell, Jingle BAM! Holiday Dessert Party. In 2018, the Jingle Bell, Jingle BAM! Holiday Party was offered from November 6, 2018 – January 6, 2019. The Jingle Bell, Jingle BAM! Holiday Dessert Party takes place offered nightly, 1.5 hours prior to each performance, in the courtyard of the Chinese Theater. This separately ticketed event includes a private dessert party, a special VIP character meet and greet and reserved viewing for Jingle Bell, Jingle BAM! and Disney Movie Magic. Each dessert party guest will get a pair of 3D HoloSpex glasses to use while watching Jingle Bell, Jingle BAM! The glasses create spectacular holographic illusions of gingerbread men, candy canes, snowflakes and ornaments on any bright point of light. Seating at the dessert party is mainly outdoors and uncovered and seating is limited. Wheelchairs and ECVs can be accommodated. In the event of potential rain, the dessert party will be moved to an alternate covered location. Reservations for the 2018 Jingle Bell, Jingle BAM! Holiday Dessert Party opened on August 16. Go to the Jingle Bell, Jingle BAM! Holiday Dessert Party page or call (407) WDW-DINE (939-3463) to book. Please note: admission to Disney’s Hollywood Studios is required and is not included in the price. In 2019, Mickey’s Very Merry Christmas Party will be offered from 7:00 pm to midnight on November 8*, 11*, 12*, 14*, 15*, 17*, 19*, 21*, 22*, 24*; December 1*, 3*, 5*, 6*, 8*, 10*, 12*, 13*, 15*, 17*, 19*, 20 and 22. Mickey’s Very Merry Christmas Party is held after the regular closing of Magic Kingdom and requires separate admission. (You don’t have to have paid admission on the same day to the Magic Kingdom in order to attend the special after-hours event.) The event is held from 7:00 pm to midnight on select nights, usually running from about the second week of November through approximately a week prior to Christmas. Guests with Very Merry Christmas Party tickets are admitted to the park as early as 4:00 pm. You will need to get a wristband that allows you to stay in the park after the party begins. Admission to the event includes complimentary hot chocolate and cookies, “snow” on Main Street, holiday stage shows, carolers, two performances of Mickey’s Once Upon A Christmastime parade and the Holiday Wishes fireworks spectacular. Mickey’s Most Merriest Celebration is presented on the Cinderella Castle Forecourt Stage. Mickey and his pals invite some of their friends for an unforgettable Christmas party filled with music, dancing, color and fun. During A Frozen Holiday Wish, Queen Elsa using her incredible powers to present a gift to everyone in the kingdom—transforming Cinderella Castle into a sparkling, icy centerpiece for the celebration. Plus, most of the major attractions will be open. You can purchase tickets to the Holiday Wishes Fireworks Holiday Dessert Party at Tomorrowland Terrace, which includes a private dessert party with a view of Holiday Wishes fireworks. For access to a better viewing area you can purchase tickets to the Holiday Wishes Fireworks Holiday Dessert Party with Plaza Garden Viewing, which includes a private dessert party and admission to a reserved viewing area for the Holiday Wishes fireworks. New for 2018, you can purchase tickets to Tony’s Most Merriest Town Square Party, which includes a selection of hors d’oeuvres, desserts and access to a reserved viewing area for Mickey’s Once Upon A Christmastime Parade. Is Mickey’s Very Merry Christmas Party worth the money? Depends on your plans. Be aware that the same parades, shows, “snow” experience and fireworks (but not the hot chocolate and cookies) are offered as part of regular admission if you visit Magic Kingdom starting the day after Mickey’s Very Merry Christmas Party ends, through New Year’s Eve. So if you will be visiting Magic Kingdom between the day after the party and New Year’s Eve, it might not be worth the extra money to attend Mickey’s Very Merry Christmas Party earlier in the month. The special character meet and greets, some (fairly minor) special decorations, and some commemorative merchandise are only available at the party. It’s fun to have dinner at Tony’s Town Square or Liberty Tree Tavern just before the party. This allows you to be in the park right when the festivities begin. The two restaurants book up quickly, so make reservations as early as possible (180 days in advance). Typically, ticket prices are least expensive for early November, a bit more for mid-November and early December and most expensive for the last few dates in December. In the past, the last party before Christmas (December 21 in 2018) has sold out well in advance. Tickets purchased on the day-of (if available) will cost an additional $10 per ticket, except for December 20 & 22 where the advance purchase prices is the same as the day-of price. *Disney Vacation Club members and Disney Annual and Seasonal Passholders can buy advance discounted tickets for most November dates and selected dates in December. Tickets must be purchased in advance. 2019 Mickey’s Very Merry Christmas Party tickets went on sale April 8, 2019. Tickets can be purchased through Undercover Tourist (there’s no discount, but it can be convenient if you’re buying other tickets at the same time), or direct from Disney via the Mickey’s Very Merry Christmas Party page. In 2018, the Holiday Wishes Dessert Party at Tomorrowland Terrace was offered November 8, 9, 12, 13, 15, 16, 25, 27, 29; December 2, 4, 6, 7, 9, 11, 13, 14, 16, 18, 20 and 21, as part of Mickey’s Very Merry Christmas Party. This separately ticketed premium event includes a private dessert party with a view of Holiday Wishes fireworks. Enjoy holiday-themed cupcakes and desserts along with sparkling cider, signature lemonades, specialty Christmas drinks, hot chocolate, coffee or tea. The Holiday Wishes Fireworks Holiday Dessert Party at Tomorrowland Terrace costs $89.46 per adult and $53.25 per child (age 3 to 9), tax included. Admission to Mickey’s Very Merry Christmas Party is required and is not included in the price of this package. Seating will be available at the dessert party on a first-come, first-served basis, but every table features views of Cinderella Castle. Reservations for the 2018 Holiday Wishes Fireworks Holiday Dessert Party at Tomorrowland Terrace opened on May 24. Reservations can be made on the Holiday Wishes Fireworks Holiday Dessert Party at Tomorrowland Terrace page or by calling (407) WDW-DINE (939-3463). Please note: admission to Mickey’s Very Merry Christmas Party is required and is not included in the price. In 2018, the Holiday Wishes Fireworks Holiday Dessert Party with Plaza Garden Viewing was offered November 8, 9, 12, 13, 15, 16, 25, 27, 29; December 2, 4, 6, 7, 9, 11, 13, 14, 16, 18, 20 and 21, as part of Mickey’s Very Merry Christmas Party. This separately ticketed event includes a private dessert party and admission to a reserved viewing area for the Holiday Wishes fireworks. Enjoy holiday-themed cupcakes and desserts along with sparkling cider, signature lemonades, specialty Christmas drinks, hot chocolate, coffee or tea. The Holiday Wishes Fireworks Holiday Dessert Party with Plaza Garden Viewing costs $73.49 per adult and $43.67 per child (age 3 to 9), tax included. Admission to Mickey’s Very Merry Christmas Party is required and is not included in the price of this package. Seating will be available at the dessert party on a first-come, first-served basis. Reservations for the 2018 Holiday Wishes Fireworks Holiday Dessert Party with Plaza Garden Viewing opened on May 24. Reservations can be made on the Holiday Wishes Fireworks Holiday Dessert Party with Plaza Garden Viewing page or by calling (407) WDW-DINE (939-3463). Please note: admission to Mickey’s Very Merry Christmas Party is required and is not included in the price. New for 2018, the Tony’s Most Merriest Town Square Party was offered at Tony’s Town Square Restaurant on November 8, 9, 12, 13, 15, 16, 25, 27, 29, 30; December 2, 4, 6, 7, 9, 11, 13, 14, 16, 18, 20 and 21 as part of Mickey’s Very Merry Christmas Party. This separately ticketed event includes a selection of hors d’oeuvres and desserts, along with beer, wine and non-alcoholic beverages and access to a reserved viewing area for Mickey’s Once Upon A Christmastime Parade. Beginning at 9:30 pm, attendees can pop in and out of Tony’s Most Merriest Town Square Party at their leisure. At 11:00 pm, attendees will have access to a special reserved viewing area for Mickey’s Once Upon A Christmastime Parade as it makes its way down Main Street, U.S.A. This party continues until 12:30 am, ending 30 minutes after Mickey’s Very Merry Christmas Party. Tony’s Most Merriest Town Square Party costs $105.44 per person, tax included. 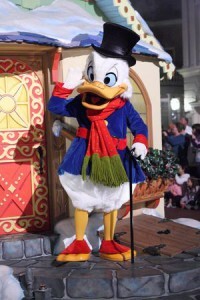 Admission to Mickey’s Very Merry Christmas Party is required and is not included in the price. Reservations for the 2018 Tony’s Most Merriest Town Square Party opened on October 29 for Annual Passholders and Disney Vacation Club members and for everyone else on October 30. Reservations can be made on the Tony’s Most Merriest Town Square Party page or by calling 407-827-7348. Please note: admission to Mickey’s Very Merry Christmas Party is required and is not included in the price. In 2018, the Candlelight Processional was offered November 22 through December 30. There are normally three performances each night, at 5:00, 6:45 and 8:15 pm. In 2018, the Candlelight Processional schedule was first announced on July 6. The Candlelight Processional is an annual event at the America Gardens Theatre in World Showcase at Epcot. It consists of a celebrity narrator presenting the Biblical Christmas story, plus a large choir and an orchestra performing traditional religious Christmas carols. The Processional is an explicitly Christian religious presentation with a “church service” feel to it. Each show runs about 40 minutes. You’ll need to line up at LEAST 45 minutes prior to the show if you want to have any hope of getting in (or buy the Candlelight Processional Dining Package for guaranteed entry). There is no additional charge for the performance over and above your Epcot admission. December 28 – 30: Cal Ripken. Jr.
You can purchase a special Candlelight Processional Dining Package. With this special package you pay a flat rate for a sit-down meal at an Epcot restaurant and you receive “preferred seating” for the Candlelight Processional. Admission to Epcot is not included in the dining package price. Lunch and dinner packages are available at select Epcot restaurants. Breakfast, lunch and dinner options are also available at Ale & Compass at Disney’s Yacht Club Resort. Breakfast and dinner options are also offered at Trattoria Al Forno at Disney’s BoardWalk. Based on our experience, getting the package may be the only way you’ll get a seat at all, particularly on weekend nights. Expect to wait in a significant line to enter the show, even if you have the package. Breakfast Candlelight Dining Packages start at $40.47 per adult (age 10+) and $23.43 per child (age 3-9), tax included. Lunch Candlelight Dining Packages start at $53.25 per adult (age 10+) and $18.09 per child (age 3-9), tax included. Dinner Candlelight Dining Packages start at $58.58 per adult (age 10+) and $18.09 per child (age 3-9), tax included. 2018 Candlelight Processional Dining Packages went on sale July 11. To make a reservation, go to the Candlelight Processional Dining Package page or call (407) WDW-DINE (939-3463). Please note: admission to Epcot is required and is not included in the dining package. During the month of December, Disney offers 25-minute “sleigh” rides through the woods from the Ft. Wilderness Campground. (The horse-drawn vehicle is wheeled but made to look like a red sleigh, complete with sleigh bells!) Each person receives a special limited-edition pin. After your ride you can stroll through the barn to check out where the horses live and learn more about them. You can book up to 180 days in advance by calling (407) WDW-PLAY (939-7529). First, be sure to read our survival guide to visiting Walt Disney World at Christmas! You can enjoy the Candlelight Processional at Epcot, Cinderella Castle Dream Lights and the special parades, shows and fireworks at Magic Kingdom, Epcot International Festival of the Holidays and all kinds of Christmas decorations throughout Walt Disney World. There are special meals available at certain restaurants on Christmas Eve and Christmas Day. You can reserve holiday meals up to 180 days in advance by calling (407) WDW-DINE (939-3463). Note that “holiday pricing” (i.e. higher prices) will be in effect for some restaurants (particularly the buffets and character meals) from mid-December through the first few days of January (holiday season). Other restaurants may charge a premium on Christmas Eve and/or Christmas Day, so be sure to ask when booking reservations. Religious services have been held on Christmas Day only in the Fantasia Ballroom at the Contemporary Resort. Catholic Mass will be held at 8:00 am and 10:30 am. A Protestant service will be held at 9:15 am. If you plan to attend, it is best confirm the time and location with the front desk or concierge. Magic Kingdom, Epcot and Disney’s Hollywood Studios all stay open late on New Year’s Eve and offer extra entertainment, usually including live performances, extra parades and fireworks. These festivities are included in regular park admission. Disney’s Animal Kingdom closes at the regular time and does not offer New Year’s Eve events since they would disturb the animals. Christmas decorations remain up throughout Walt Disney World through New Year, and generally several days past the first of the year. Special theme park events for New Year’s Eve are usually offered, including special fireworks, dance parties, live bands, etc. New Year’s Eve at the Atlantic Dance Hall at Disney’s Boardwalk Resort includes a video DJ. You must be 21 years of age or older (with ID) to enter Atlantic Dance Hall on New Year’s Eve, and the event requires a separate ticket. There are special meals available at certain restaurants on New Year’s Eve and New Year’s Day. You can reserve holiday meals up to 180 days in advance by calling (407) WDW-DINE (939-3463). Note that “holiday pricing” (i.e. higher prices) will be in effect for some restaurants (particularly the buffets and character meals) from mid-December through the first few days of January (holiday season). Other restaurants may charge a premium on New Year’s Eve and/or New Year’s Day, so be sure to ask when booking reservations. For New Year’s Eve 2018, the World Show Place Pavilion in Epcot hosted a buffet from 4:00 pm – 9:30 pm. The cost is $72.90 per adult (age 10 and up) and $44.38 per child (age 3-9), tax and gratuity included. Advance reservations are required and Epcot admission is not included in the price. To make a reservation call (407) WDW-DINE (939-3463). For New Year’s Eve 2018, Disney offered a Fort Wilderness Beach Dessert Party at Clementine’s Beach from 10 pm to 12:30 am. It includes viewing of the Magic Kingdom fireworks, a variety of dessert, fruits and cheeses, as well as a champagne toast at midnight. The cost is $105.44 per adult (age 10 and up) and $62.84 per child (age 3-9), tax included. Please note: this event takes place outdoors on sand and is uncovered. Reservations can be make online or by calling (407) WDW-DINE (939-3463). Disney Countdown to Midnight is December 31, 2018 from 8:00 pm until 12:15 am on January 1, 2019 in the Fantasia ballroom. This celebration includes dining, live music, libations and more. An interactive band and DJ will fill the dance floor (and Mickey and Minnie may make a special appearance). Welcome in the new year with a glass of bubbly and a viewing of the New Year’s Eve fireworks in the Magic Kingdom. This party is designed for guests 18 and older. The cost is $275 per person, tax and gratuity included. Disney Ink & Paint Club Experience – Located adjacent to the Fantasia Ballroom at Disney’s Contemporary Resort, this special reception takes place 7:00 pm – 12: 15 am. Ticketed guests can visit a special lounge throughout the evening, starting with a featured reception from 7-8 pm. This vintage Disney Animation-inspired room has silver Chiavari chairs, metallic tables and references to classic Disney Animation filling the room. Disney Ink & Paint Club is only available as a part of an enhanced ticket that includes access to both the Disney Countdown to Midnight and the Ink & Paint Club. The cost is $450 per person, tax and gratuity included. Access to Ink & Paint Club must be purchased concurrently with the Disney Countdown to Midnight ticket and cannot be added on at a later date. Pixar Party: A New Year’s Eve Celebration is for children of all ages, and is a family-friendly way to ring in the New Year with a Disney•Pixar-inspired dinner in the Ballroom of the Americas.The Pixar Party will be December 31, 2018 from 8:00 pm until 12:15 am on January 1, 2019. The decorations include theatrical backdrops, set pieces and fun props that re-create the worlds of the Pixar films. Characters from Toy Story, The Incredibles, Cars and Up will join the party. Special activities for kids include: Pixar face painting, a balloon artist and a boot camp with Sarge, while an interactive DJ will spin hits from Radio Disney. Dinner is buffet style. At midnight, the celebration will head outdoors to ring in the New Year with a viewing of the Magic Kingdom fireworks. The cost is $190 per person, tax and gratuity included. 2018 New Year’s Eve Celebrations reservations at Disney’s Contemporary Resort opened on July 9. Call (407) WDW-DINE (939-3463) for more information or to make a reservation.